This project explored the levels of muscle fatigue experienced when using a large multi-touch display in horizontal and vertical configurations over a one-hour period. Subjective measures showed a significant level of overall arm muscle fatigue after the task for both configurations, while objective measures showed a significant level of muscle fatigue on the middle deltoids and the non-dominant extensor digitorum for the vertical configuration only. 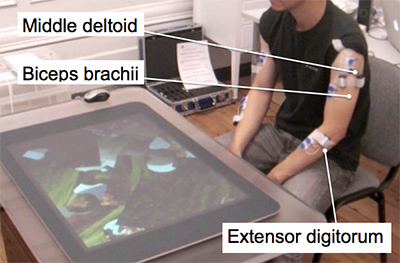 These results have clear implications on interaction design for large interactive displays. Vertical interactive displays, while suitable for intermittent use over short periods of time, are not as suitable for frequent longer use. For tasks that require frequent interactions in the range of one or more hours, we recommend that designers should choose a horizontal display where possible to minimize damage to the musculoskeletal system, modify the design of interaction techniques to reduce the need for continuous interaction, or to change the location of distant interactions when possible to more accessible locations on the display. This project was a collaboration with Shiroq Al-Megren from the University of Leeds; and Ahmed Kharrufa, Amy Holden, Selina Sutton and Patrick Olivier from Newcastle University.